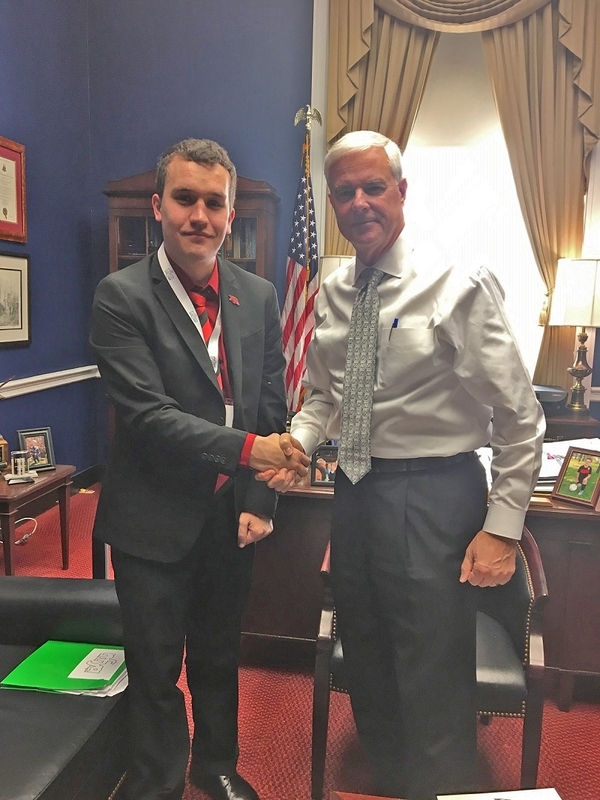 Nick Lange, a student in the University of Arkansas' EMPOWER program, meets U.S. Rep. Steve Womack, R-Ark., in his Washington, D.C., office in January. A student in the EMPOWER program at the University of Arkansas recently traveled to Washington, D.C., as a young adult representative of the Texas Neurofibromatosis Foundation/Littlest Tumor Foundation and NF Midwest. Nick Lange, 21, has neurofibromatosis 1, said to be the most common neurological disorder caused by a single gene, affecting 1 in 3,000 people worldwide. EMPOWER is a four-year, non-degree college experience program for students with cognitive disabilities that incorporates functional academics, independent living, employment, social/leisure skills and health/wellness skills. The acronym for the non-degree program for students with mild intellectual differences stands for Educate, Motivate, Prepare, Opportunity, Workplace readiness, Employment, Responsibility. While in Washington, Lange with other young adults with the disease from across the country visited congressional offices. They met with members of Congress or their aides about the affliction and discussed Congressional Directed Medical Research Programs funded by the Department of Defense, specifically tumor research that could help NF patients as well as other tumor-based diseases, according to information from the foundation. Lange met with Arkansas 3rd District Rep. Steve Womack. "It was really exciting to meet Fayetteville's rep and get to talk to him," Lange said. "I told him how NF affects me so he would understand why the funding is so important. I also wanted to tell him about the EMPOWER program and how much it has changed my life. He's also a huge Razorback fan like me." Lange was diagnosed with NF at age 5. As a result of it, he has developed an optic glioma and neurofibromas on his arms and torso. As typical with NF1, he also has multiple learning differences. Lange's NF did not stop him from graduating from high school, for him Fairhill School in Dallas, which serves students with learning disorders. There he gained confidence and thrived, though he also struggled throughout with attention deficit/hyperactivity disorder, severe dysgraphia (writing disability) and nonverbal learning difference. He participated in drama, student council and the school's bowling team, which qualified for state championships his junior year. At the end of his senior year, Lange didn't know what he would do next. He had visited University of Arkansas when he was in eighth grade during a college visit for his older sister and fell in love with the campus. It became his dream school, although he didn't have the grades or the aptitude to be accepted to a traditional college program. Coincidentally, the month Lange graduated, his mother heard about EMPOWER. His parents immediately contacted Tom Smith, the program's faculty adviser. Smith is a University Professor of special education. Lange was accepted into its inaugural class and, in fall 2017, he became a Razorback. These days, Lange lives in a dorm, audits classes, attends football games, works on campus and belongs to student organizations, including Lead Hogs and Residents Interhall Congress. EMPOWER also provides student mentors that help him acclimate to college life. In his junior and senior years, he will undertake internships in his area of interest so he can graduate with work experience to allow him to live independently. The Washington Neurofibromatosis leadership conference ended with a congressional briefing featuring a panel of specialists on the value of the Congressional Directed Medical Research Programs for those with the disease. As a result of the trip, Lange said he wants to continue to educate people on NF and advocate for research.